Looking south across the waters of Georgia Strait from Boyle Point reminds residents of why they live on Denman Island, and gives visitors reason to come and stay. Picturesque Chrome Island, and its lighthouse, built in 1898, lies just off shore, and to the east, the lovely island of Hornby is set against the Coast Mountains. The waters around the point are rich with sea life, and at low tide hours can be spent wandering the shoreline. Schools of herring crowd the waters in early winter and attract seals, California and Steller sea lions, who in turn might bring an Orca, looking for its own meal. The 1.6 km trail from the parking lot is an easy hike, passing through nice stands of second growth conifers. In some areas, moderately high cliffs look over the sea. In times long past, the straight trees growing near the point were harvested for ship’s masts. The 125-hectare undeveloped park is very near the ferry terminal to Hornby Island, and well worth a visit. Activities in the park include walking, cycling, kayaking and nature appreciation. A popular kayak route goes from Deep Bay on Vancouver Island across Baynes Sound to Boyle Point. Wildlife includes deer, and marine birds. There are no bear or cougar present on the island. Boyle Point is a day use area only. No camping is permitted. A pit toilet and information kiosk is available at the parking lot. Boyle Point is located on Denman Island. 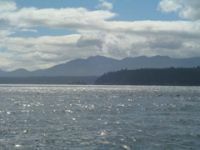 Take the Denman Island Ferry from Buckley Bay, off Hwy #19a on central Vancouver Island. Once on the island, follow Denman Road to the Hornby Island Ferry terminal; turn right and follow East Road to the park.